Hong Kong Maxim's Group starts selling the Butahage's "BUTADON" in DONDONYA. August 8, 2013 -- Obihiro Hageten announced "Tokachi Butadon Fair" will be held August 8 through November 3 at DONDONYA which is the Japanese restaurant operated by Hong Kong Maxim's Group. At 13 DONDONYA restaurants, they will start selling "Butadon"(pork bowl) which is a Japanese dish consisting of a bowl of rice topped with pork simmered in a mildly sweet sauce. The "Butadon" is arranged by BUTAHAGE, and it is authentic with over 70 years of history. The sauce is made by same recipe of BUTAHAGE, and pork is sent from Hokkaido. "We are very happy to have this great chance introducing authentic Butadon to Hong Kong people, and want to have interests for Obihiro and Tokachi culture," said Hitoshi Yano, BUTAHAGE's CEO. Founded in 1956, Hong Kong Maxim's Group now operates over 790 outlets in Hong Kong and China. The Group offers a diversified service comprising Chinese, Asian and European restaurants, fast food outlets, cake shops, coffee shops, Japanese chain restaurants and institutional catering, while providing a range of festive products, spanning from mooncakes, Chinese New Year puddings, rice dumplings to Chinese preserved meat. Hong Kong Maxim's Group also operates air catering services at 11 airports in China, including Beijing and Shanghai, through joint ventures. Butadon BUTAHAGE restaurant specializes in "Butadon", pork bowl. Obihiro Hageten which was founded in 1934 opened BUTAHAGE restaurants. Although "Butadon" has been popular in these days, many of them have differences between original one. By being opened in Tokyo area, Sapporo area and Obihiro area, these restaurants have played an important role of expanding what authentic Butadon is to Japanese people. 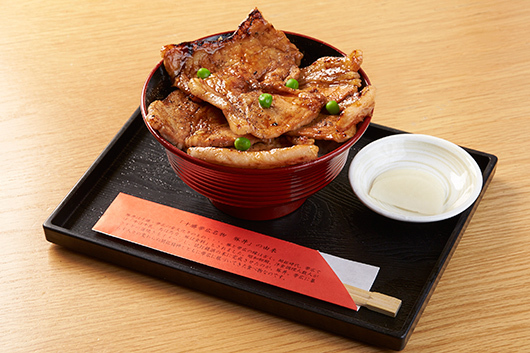 BUTAHAGE's Butadon consists of special tenderloin and traditional sauce. Butadon, all produced by BUTAHAGE will be available in DONDONYA honten and DONDONYA shokudo. The premium taste with over 70 years of history. Using imported fastidious fresh pork and ingredients from Hokkaido, Japan. All you have to do now is step through DONDONYA doors, the rest is up to professional DONDONYA team. For more information, please visit DONDONYA website or Facebook page.